Vizio has announced an extensive new range of Windows 8 computers, including two all-in-one machines and a selection of laptops, ready to take on the influx of similar products when Microsoft releases its new OS at the end of the month. 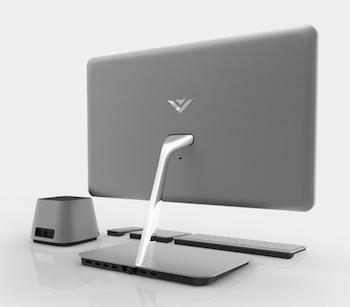 The new line-up starts with Vizio’s All-in-One Touch PCs, which are available with either a 24-inch or 27-inch LED display, each with a 1080p resolution. The screens can recognize gestures made with up to 10 fingers, but if you don’t want to reach out and touch the screen, Vizio supply a touchpad with the system too. There are three different touchscreen models available, primarily differentiated by their processor, starting with the basic 2.4GHz Intel Core i3 and 2.5GHz Core i5 in the 24-inch PCs, and moving up to the quad-core, 2.4GHz Core i7 in the range-topping 27-inch All-in-One Touch PC. Also found in the 27-inch system is 8GB of RAM, a 1TB hard drive backed up by a 32GB SSD to increase performance, two HDMI ports, Bluetooth, Wi-Fi and a Nvidia GeForce GT 640MLE graphics card. 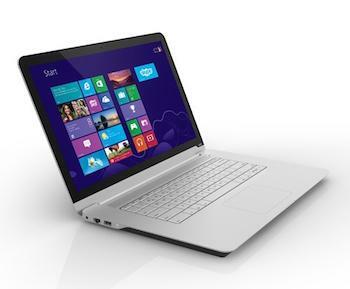 The 24-inch PCs get either 4GB or 6GB of RAM, loose the 32GB SSD and change the graphics card for an Intel HD 4000. All three come with the touchpad and keyboard, plus a 2.1 audio system with a standalone subwoofer and SRS Premium Sound HD. Pricing is competitive, with the basic 24-inch touch PC starting at $999, then moving to $1,199 before topping out at $1,539 for the 27-inch model. On to the laptops then, and like elements of the All-in-One Touch PCs — the keyboard and touchpad for example — the design and styling choices may look familiar. There are four models in total, three of which have 15.6-inch screens, while the final entry-level notebook has a 14-inch display. Let’s start there. It’s priced at $849 and the 14-inch screen has a 1600 x 900 pixel resolution, while inside is an Intel Core i5 processor with a clock speed of 1.7GHz. There’s 4GB of RAM and a 128GB SSD, plus an Intel HD 4000 graphics card, an HDMI-out, Bluetooth and a webcam. Vizio says the battery will provide approximately 7 hours of use before it needs recharging. Vizio are labeling the 14-inch and two of the 15.6-inch PCs as “Thin + Light,” or ultrabooks to you and me. So, how thin and light are they? 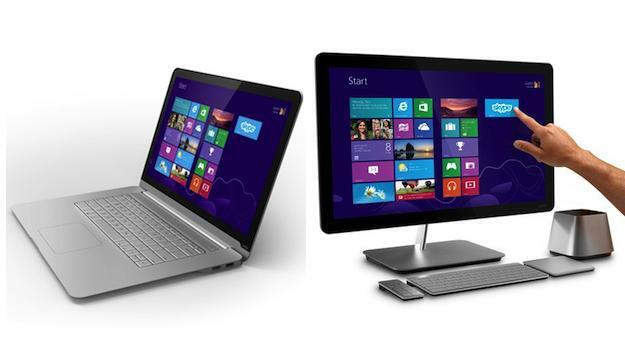 Just 16mm and 1.55 kgs for the 14-inch ultrabook, and 17mm and 1.76 kgs for the 15.6-inch models. The two 15.6-inch Thin + Light ultrabooks both have 1080p displays, with either a combination of a 1.7GHz Core i5/4GB RAM/128GB SSD, or a 1.9GHz Core i7/4GB RAM/256GB SSD, and they’re priced at $899 and $1,199 respectively. Finally, we have the 15.6-inch Notebook, which is also priced at $1,199 and comes with an Intel Core i7, quad-core 2.3GHz chip, 8GB of RAM and the same 1TB/32GB SSD combo seen in the 27-inch All-inOne Touch PC. All are listed as coming soon on Vizio’s website, and the press release doesn’t mention a release date either, although due to Windows 8‘s end of October launch, plus the fact Vizio calls these models its “Holiday PC Line-up,” it seems likely they’ll all be along in November.